Building and pest inspections Make sure you choose Two inspectors. Two Inspectors and Pre purchase Building and pest and inspections. Firstly you should always choose two inspectors. This is the most important decision that you will make is to get inspectors that specialise in their field of inspections. 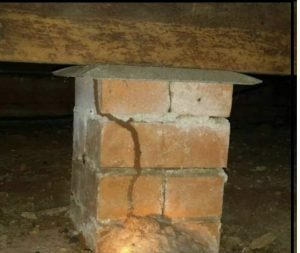 The Qbcc states only a licenced termite inspector and Only a completed residential building inspector can do pre purchase inspections. None of certified home inspections inspectors do both inspections. You are assured of a thorough inspection and the likelihood of missing something is substantially reduced. As they say two eyes are better than one. This picture above shows termite leads missed by a single inspector doing both building and the pest inspection. The young couple who bought the house got the shock of their life to find this out. Especially after the inspection report said there was no issues. It was their first home so it wasn't a good start for them. 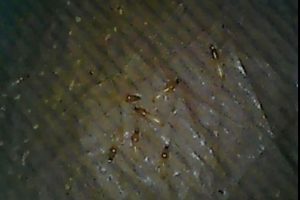 Live termites found in the wall cavity during an invasive inspection. The picture below shows coptotermes found in the wall area above the leads in the subfloor. Price should not be the main reason. The reason People go with these inspectors is generally price related as these inspectors doing both will charge a lot less than two inspectors. As the saying goes you get what you pay for so please make sure you get your inspection done by two experienced inspectors. All our Building and pest inspectors only inspect what they have years of experience in. In the past only an experienced termite inspector could carry out a pre purchase timber pest inspection. Also a building inspector only could do building inspections. 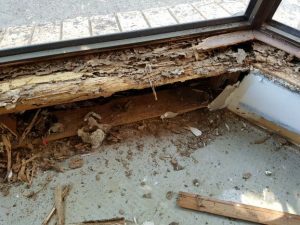 Additionally it took them years to get their licence only after they had completed hundreds of inspections and termite treatments and termite identification under supervision. 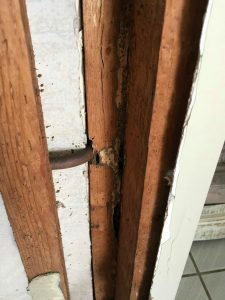 The image below shows termite damage missed . Yes this was missed apparently the timber pest inspection was carried out only using a thermal camera. 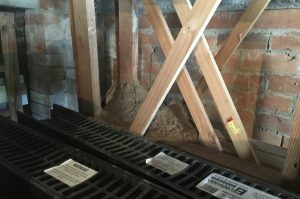 The picture below.Termite damage not found in the first inspection and it was pretty obvious and should not have been missed. The entry point was where the hot water service overflow was draining and the termites followed the pipe into the wall cavity. Experienced Inspectors in their field of expertise. The problem we face today that people can get their timber pest inspection licence in as little as a few weeks. Don't get me wrong i have come across a few inspectors that are very good but still lack this experience. But would you risk your most valuable asset inspected by someone that is lacking in experience? Certified home inspections have been engaged to do another building and pest inspection after the house had already been inspected . The purchasers had moved in and found a lot of unreported issues that should have been picked up. And some of them were very obvious . So what they thought was an exciting phase in their life become a nightmare . They found themselves going to solicitors to try and remedy this. Furthermore wording in reports protect them if they make oversights so it is very difficult to remedy these mistakes. So if you are purchasing a new home my only advice is to use two inspectors. Give Vicki or Lauren a call and they will guide you through the inspection process.